Opened in April 2005, Swiss-Bel hotel Golden Sand Resort is the only 5-star international resort in Hoi An, offers magical hospitality experiences. Relax on this fantastic beach resort and you will enjoy the choice of the spacious white sandy beach relaxing under a Beach Umbrella or choose to lie beside the 150 meter swimming pool that boasts two pool bars. 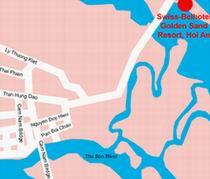 Swiss Belhotel Golden Sands Resort is located right on Cua Dai beach, just 10 minutes from the World Heritage site of Hoi An Town. The private beach of the resort last up to 400 metres, and the width of the shore up to 100 metres, making the resort is very large in size of up to 4 ha. Travel time to Danang International Airport (DAD) is approximately 45 minutes and distance is 35 kilometers (22 miles). The best way to get to the hotel from the airport is by taxi or hotel-arranged shuttle. Major credit cards are accepted: American Express, Visa, Master Card, Dinner Club & JBC. Satellite TV with CNN, HBO, ESPN etc. In-room dining up to 23:00 hrs. 60 rooms low rise building, offer either King bed or Twin beds room, Connecting rooms available. 34 rooms low rise building, offer King bed only, vary on size from 40-45 m2. 8 villas living and bed room with King size bed en-suite offer Ocean view and balcony in area of 90 m2. 6 rooms low rise building, offer Ocean view, vary on size from 40-45 m2. All-Day-Dining restaurant (air conditioned alfesco). International cuisine, serving breakfast, lunch & dinner. Ground floor overlooking swimming pool & beach. The Sands Ball room offer extensive in-house conference and banquet facilities from small meetings up to large group of of 350 seats in theatre style. All secretarial services available.